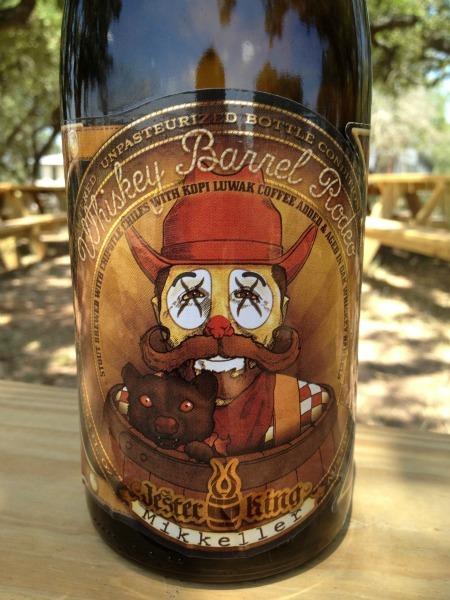 We received word from Texas beer geeks today that bottles of Jester King / Mikkeler Whiskey Barrel Rodeo have begun showing up on store shelves somewhat sooner than expected. Whiskey Barrel Rodeo (12.0% ABV) is the barrel aged version of Jester King / Mikkeller Weasel Rodeo, an unfiltered, unpasteurized, naturally carbonated Imperial Oatmeal Stout brewed with chipotle peppers, smoked malt and Vietnamese Kopi Luwak Coffee and fermented with farmhouse yeast. 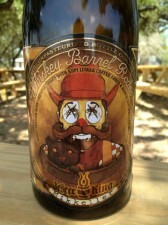 After being brewed with Mikkeller at Jester King in November of 2011, Whiskey Barrel Rodeo spent six months aging in whiskey barrels followed by another three months of bottle conditioning. Unlike most of our barrel aged beers where we use barrel aging to impart funky, sour flavors and aromas, Whiskey Barrel Rodeo was aged in whiskey barrels to impart flavors of oak, vanillin and residual whiskey. The quantity of Whiskey Barrel Rodeo is very limited. We only bottled about 100 cases (1200 750ml bottles). This was a really fun collaboration between a strongly European influenced American brewery and a strongly American influenced European brewer. The result is, in some ways, a bit of a departure from our usual range, but even with the whiskey barrels, weasel poo, spicy peppers, and smoke, we tried to remain true to the principles of subtlety, simplicity and restraint.